soooo, I ordered a new t-shirt yesterday from dropdead clothing. I originally saw the t-shirt in a blog post on the peta2 website, and just had to get one. 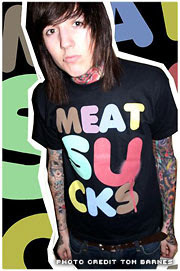 but yeah... how awesome are vegetarian t-shirts?! I love buying t-shirts which have a design which actually makes a point. like my anti-smoking one, or my Make Poverty History campaign t-shirt. I think when it arrives I might throw it on to make a new video for the tubes. Vegetarians are hotter than meat-eaters! ok, so I really fancy getting a bobble hat to keep my head nice and warm this winter, but i can't decide which one to buy... help please? or if anyone knows a website where I can get cool bobble hats from, then please let me know! ... just thought i'd put this in a blog too, along with the results of course... it turned out most people liked number 2 the most, and i think that was my favourite one as well, although it isn't exactly what i was looking for, but i can't find any better ones online, and i looked around the shops in town for ages last week and couldnt find one i liked, so i think i'm just going to go ahead and buy option 2. With that in mind, I think I'll cut this blog short and continue my uplifted mood, by going to watch hairspray. Real men like musicals. Fact. 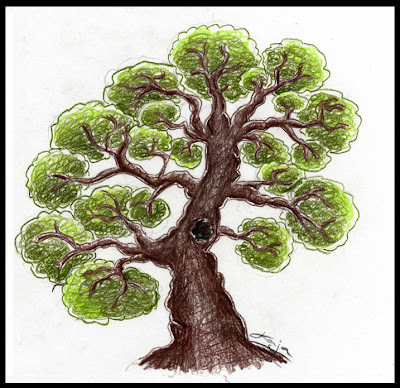 on my myspace profile at the moment i have a crappy tree that i drew on Paint..
it's so awesome! it's about a million times better than my tree..
i love getting little things like this from people who like my videos. it may seem a little silly, but seeing something like this pop up in your inbox really does brighten your day and puts a smile on your face.